This article is about character from Hindu Epic Ramayana. For Maurya King, see Dasharatha Maurya. Dasharatha was son of King Aja of Ayodhya and Princess Indumati of Vidarbha. His birth name was Nemi, but he acquired the name Dasharatha as his chariot could move in all eight directions, fly as well as come down on earth and he could fight with ease in all these directions. 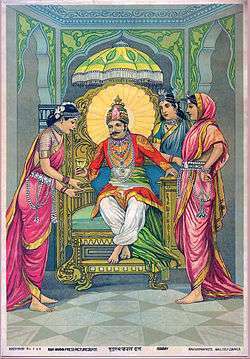 Dasharatha became king after his parents died. He was a great warrior who single handedly conquered the whole earth with his prowess and had defeated and slain many Asuras in war. Dasharatha has three queen-consorts, namely, Kaushalya, Sumitra and Kaikeyi. Kaushalya was from the Kingdom of Magadha. Sumitra was from Kashi. Kaikeyi was from Kekeya Kingdom. 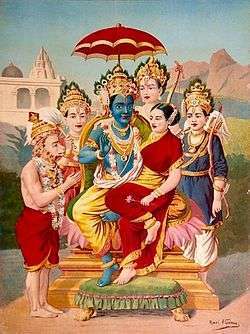 To marry her in immense desire to beget a son he promised her father Aswapati and her brothers that the son born of her womb would succeed him as King of Kosala. The count of number of his wives varies from versions to versions ranging from 350 to 60000. But he has only three chief consorts. Dasharatha performed two yajnas with the help of Sage Rishyasringa on the advice of Vashistha. One was Ashwamedha and other was Putrakameshti. It is said that Dasharatha and Kaushalya has a daughter Shanta, who was Rishyashringa's wife. As the conclusion of Yagna drew near, Agni sprang out from the yagnakunda(sacrificial fire pit) and handed Dasharatha a pot of kheer advising him to distribute it among his queens. Kaushalya ate half the kheer, Sumitra ate a quarter of it. Kaikeyi ate some and passed the pot back to Sumitra who consumed the kheer second time. Thus the princes were conceived after the consumption of the kheer. Since Kaushalya had consumed the largest portion she gave birth to Rama. Kaikeyi gave birth to Bharata. 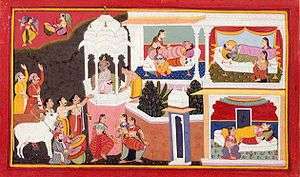 Sumitra gave birth to Lakshmana and Shatrughna. Sage Vishvamitra came to Dasharatha to send Rama to fight with demons. A maid of Queen Kaikeyi named as Manthara convinced her that the throne of Maharaja Dasharatha belonged to her son Bharata and that her step-son—crown-prince Rama(the hero of Ramayana)—should be exiled from the kingdom. The ugly maid reminds Kaikeyi of the two boons Dasharatha and also the promise made to her father and brothers at the time of her marriage that the son born of her womb would succeed him as King of Kosala. By crowning Rama as king, Dasharatha is doing injustice to whole Kekeya Kingdom and betraying her father and brothers. Thus then after Dasharatha is reminded by Kaikeyi about the two boons he has yet to fulfill for her. She talks of the time when she had saved him from the demons during a celestial battle against Sambasura, an enemy of both Indra and Dasharatha. During a fierce battle between the two, the wheel of Dasharatha's chariot broke and Sambasura's arrow pierced the King's armour and lodged in his chest. Kaikeyi, who was acting as Dasharatha's charioteer, quickly repaired the broken wheel and then drove the chariot away from the battle field. She nursed the wounded King back to health. Touched by her courage and timely service, Dasharatha offered her two boons. However, Kaikeyi chose to ask those boons later. King Dasharatha is obliged to fulfil those boons. 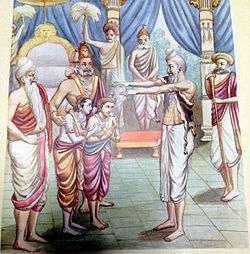 Kaikeyi demands that Bharata be crowned the king and Rama should be sent to the forest for fourteen years. Hearing this Dasharatha falls into a swoon and passes the night in a pitiable condition in Kaikeyi's palace. 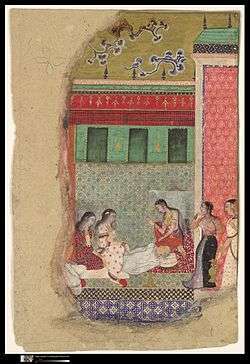 After Rama's departure to the forest, Dasharatha lies in his bed with a wailing Kaushalya. He suddenly remembers an incident which had occurred in the past. He narrates to Kaushalya about how, by accident, he had killed a young boy named Shravan mistaking him to be a deer. Dasharatha who was then a crown prince had gone hunting on the banks of River Saryu. He was an expert in hunting by determining the direction of sound and heard the gurgle of an animal drinking water. Mistaking it to be an Deer Dasharatha shot an arrow. He became mortified when he heard a human cry as the arrow found its target. Dasharatha hurried there to find a boy lying sprawled on the banks of the river with an arrow lodged in his chest. The boy rebukes Dasharatha for his unrighteous act and demands that he pull the arrow out of his chest. He also tells him to take the pitcher of water to his blind parents who must be waiting for him. The boy dies. Dasharatha approaches the blind couple and tells them about his unfortunate death. The parents, grief-stricken curse the prince "Just as we are dying due the separation from our beloved son you too shall have the same fate." Dasharatha concludes the chapter by saying that his end is near and the curse has taken effect. The place where Dasharatha killed Shravan is now known as Shravan kshetra. Following his narration of Shravan, Dasharatha passes away in the night due to pain and misery of his separation from Rama. His funeral rites were performed by Bharata and Shatrughna who were called back from Kekeya. His tomb is in a village of Faizabad district(U.P.) about 15 km away named Bilhar Ghat besides bank of river Saryu where he was cremated. This place is very devotional for Hindus. Wikimedia Commons has media related to Dasaratha.